Gil Hodges, one of the fabled Boys of Summer, put together a career that many baseball fans argue is worthy of Cooperstown. The first baseman belted 370 home runs over 18 seasons, mostly with the Brooklyn Dodgers, and topped the 30-homer mark six times. He drove in more than 100 runs for seven straight years (1949-55). As a manager, Hodges led the 1969 New York Mets–the Miracle Mets of ’69–to an improbable World Series championship. This man’s man (U.S. Marine Corps, 16th Anti-Aircraft battalion, Okinawa, Bronze Star) from Princeton, Ind., enjoyed his greatest day in the big leagues on Aug. 31, 1950. He went 5-for-5, cracked four home runs and accumulated 17 total bases. The Dodgers were at home that afternoon, at cozy Ebbets Field in Flatbush. They were playing the Boston Braves. A 23-year-old Carl Erskine, in just his third season in the big leagues, faced 29-year-old Warren Spahn, a five-year veteran with one 20-win season already on the books and 12 more to go. Erskine was a right-hander, Spahn a lefty. Brooklyn went into the game with a 68-50 record and in second place, 6 ½ games behind the Philadelphia Phillies. Boston was 68-53 and in third place, eight games out of the top spot. Each team looked to get hot over the final month of the season. Dodgers Manager Burt Shotton placed Hodges sixth in his batting order, between right-fielder Carl Furillo and catcher Roy Campanella. This was Hodges’ fifth season in the big leagues and his third year as a regular. He came up for a two at-bat cup of coffee in 1943, fought in World War II in ’44 and ’45, spent 1946 in the minors and played in just 28 games for Brooklyn in 1947. During his first year as a regular, in 1948, the converted catcher hit 11 homers, drove in 70 runs and batted just .249. The next year, he ripped 23 home runs, drove home 115 and hit .285. Hodges went into the game on Aug. 31 with a .293 batting average, 19 homers and 75 RBI. It didn’t take him long to get things going against the Braves. He ripped his first home run in his first at-bat, after Furillo singled to lead off the second inning. That put the Dodgers up 2-1. Jackie Robinson led off the third inning with a base hit, and Furillo rapped another single. That ended Spahn’s tough day. Boston skipper Billy Southworth called on Normie Ray to provide some relief. Hodges didn’t oblige. The right-handed hitter crushed a three-run home run. Brooklyn led 6-1 and tacked on four more runs that frame. The route was on. Then, things stayed quiet until the bottom of the sixth. That’s when Hodges knocked his third home run of the game, a two-run job off Boston relief pitcher Bob Hall. By the end of the inning, it was 14-1 in favor of the Dodgers. Hodges probably disappointed the Ebbets Field crowd of 14,226 when he came to back in the seventh inning. He merely hit a single. He did, however, come around to score after Billy Cox reached base on an error. The Dodgers added to more two runs that frame. Boston scored twice in the eighth to make it 17-3. Hodges knocked his fourth homer of the game, and his third two-run dinger, in the bottom of the eighth, this time off Johnny Antonelli. Final score: Dodgers 19, Braves 3. Erskine improve to 2-3 on the season; Spahn dropped to 16-15. Neither the Dodgers nor the Braves could catch up to the Phillies in 1950. Philadelphia ended the year 91-63 to capture the National League pennant and then got swept in four games by the New York Yankees in the World Series. Brooklyn came in second with an 89-65 mark. Boston fell to fourth place by season’s end, 83-71. Hodges smacked 32 home runs and drove in 113 that season. He went on to play in eight All-Star games and on two World Series winners (1955 and ’59). He was never better than on Aug. 31, 1950. So, If Tony Perez Is in, Should Gil Hodges be in, too? 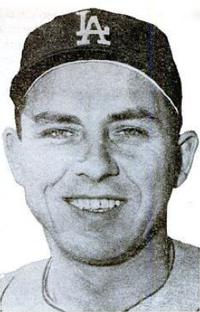 Gil Hodges hit 370 home runs in his career. Later, he led the 1969 Mets to a World Series championship. Gil Hodges was a beloved player on a beloved team. He played first base for the Brooklyn Dodgers in the 1940s and ‘50s. His home ballpark was the cozy, and oft-romanticized, Ebbets Field. The Dodgers competed for the National League pennant every year in Hodges’ time. Red Barber, Connie Desmond and Vin Scully called the action. Hilda Chester (the “Queen of the Bleachers”) led the cheers. Hodges, born in Princeton, Ind., batted right and threw right. He stood 6-feet-1 and weighed 200 pounds, a big man for that era. Hodges hit in the middle of a stacked Brooklyn line-up. His teammates were legendary players like Jackie Robinson and Pee Wee Reese. Duke Snider and Roy Campanella. And “Oisk,” Carl Erskine. They were The Boys of Summer, never to be forgotten. Was Hodges also a Hall of Fame player? We’ll find out Dec. 8. Hodges is one of the 10 nominees on the Golden Era committee ballot. (You can read more about the committee here.) If Hodges gets 75 percent of the vote, he will be inducted into Cooperstown. Hodges came up for a sip of coffee—not even a cup—as a 19-year-old in 1943. He went 0-2 and left for the Marine Corps. He missed the next two seasons. Pvt. Hodges served as a gunner for the 16th anti-aircraft battalion. Sgt. Hodges landed on Okinawa in April 1945. He earned a Bronze Star for bravery. Back in the States in ‘46, Hodges spent the season with Newport News (Va.) in the Class B Piedmont League. His good work earned him a promotion to the big club in 1947. As a back-up catcher with the Dodgers, Hodges got into just 28 games and hit only .156 in 77 at-bats. Dodger Manager Leo Durocher handed Hodges a first-baseman’s glove in spring training in 1948. Hodges never played catcher again. The first baseman belted 40 home runs in 1951 and a career-best 42 in 1954. He drove in more than 100 runs every season from 1949 through 1955. The Brooklyn Dodgers won six National League pennants during Hodges’ time. Hodges played on his eighth and final All-Star team in 1957, the team’s last season in Brooklyn. He hit more than 30 home runs six times as a Dodger. Owner Walter O’Malley, moved his team from one coast to another, 3,000 miles from Brooklyn to Los Angeles. The team won a championship in its second season in California. Hodges hit .391 in the 1959 Series, his best mark ever in the postseason. Hodges, who had hit 22 home runs in 1958, belted 25 for the world champions. He left the Dodgers after the 1961 season and played two seasons for the Mets before retiring. Hodges hit 370 home runs in an 18-year career. He drove in 1,274 runs and hit .273 but with a .359 on-base percentage and a slugging percentage of .487. His career OPS was .846 and his OPS+ was 120 with a high of 142 in 1952. Hodges had a career WAR of 44.9 with a high of 6.2 in 1954.
Who wouldn’t want an upstanding guy like Gil Hodges as a manager? The Washington Senators hired him as skipper for the 1963 season. The former Brooklyn star spent five seasons in the nation’s capital. His best season was his last one. The Senators went 76-85 in 1967 and finished sixth. The New York Mets, a comical mess in their first several seasons, hired Hodges in 1968. After leading the Mets to a 73-89 record and a ninth-place finish in his inaugural campaign, Hodges pulled off a miracle in 1969. The Mets finished 100-62 and won the World Series. A ticker-tape parade followed that most unlikely of championships. Unfortunately, the club could not repeat their incredible one-season success. The Mets went 83-79 the next two seasons. The 1972 season began with the first ever players’ strike. On April 2, while golfing with friends in West Palm Beach, Fla., Hodges, a long-time chain smoker, suffered a heart attack. Transported to a hospital, he died 20 minutes later. Hodges the Hall of Famer? Hodges finished first among first baseman in the 1950s in home runs (310), games (1,477), at bats (5,313), runs (890), hits (1,491), runs batted in (1,001), total bases (2,733), strikeouts (882), and extra-base hits (585). He didn’t lead the league in any important statistical categories. He finished in the top five in home runs four times and in the top five in RBI six times. He didn’t come close to winning an MVP award. His best finished was seventh, in ’57. He went 0-21 in the 1952 World Series. All told, Hodges hit .267 in 131 Series at-bats with five home runs. I mentioned some of Hodges’ stats. Here is a look at some stats put up by another popular first baseman, Tony Perez. The Cuban-born slugger played in an era just after Hodges and was elected to the Hall of Fame in 2000, in his ninth year of eligibility. Perez, like Hodges, never won an MVP. He finished third in 1970 with the Cincinnati Reds. Perez was selected to seven All-Star teams; Hodges was selected to eight. We’ll find out in a just a few days if Hodges will join teammates Jackie, Duke, Pee Wee and Campy in the Hall of Fame.